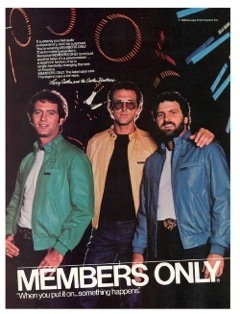 The Members Only brand was once one of the 1980’s must have items in fashion. But with time things that we once adored become passé. Since the fads and fashions of the 80’s seem to have come back, it’s no surprise that current celebrities have been seen rocking the jacket. Even the baby rumor battling Justin Beiber, LOL. But the new fashion from Members Only is pretty nice! Besides most of the jackets that look similar got the style FROM Members Only. Here’s a nugget of 80’s goodness. Enjoy!